Motorola is on a role with new gadgets, but so far none of them have been very easy to get. Good news, then, as the new Moto X goes up for pre-order starting Tuesday, September 16, Motorola announced in a blog post. That includes two versions of the phone: the new Moto X for AT&T, and the $500 (about £300, AU$550) unlocked Moto X Pure Edition that comes with stock Android. Possibly even better news is the fact that the Moto 360 is going back on sale in the US on the same day. 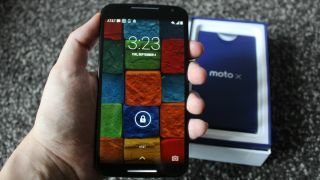 The first batch sold out quickly, though, and Motorola warns that "quantities will be limited." Both versions of the new Moto X, as well as the Moto 360, will be available Tuesday at Motorola's site starting at 11am Central Time. No word on when the new phones will actually be shipped, but Motorola says their individual ship dates will be disclosed at checkout on a per-customer basis. In addition to the phones Motorola is releasing two new gadgets on Tuesday: the Moto Hint Bluetooth headset and the Motorola Turbo Charger that the company promises will provide 8 hours of battery life after just 15 minutes of charging. And finally Motorola wants to make sure everyone is aware of its trade-in program, by which it might trade you up to $300 (about £180, AU$330) for your old phone. Presumably there will be nothing stopping global customers from pre-ordering the unlocked Moto X Pure Edition on Tuesday, but nevertheless Motorola also promises that "you'll hear more from other US carrier partners soon and from our partners around the globe regarding additional Motorola product availability."